Air admittance valves are mechanical devices that take the place of plumbing vents. They're inexpensive, they work, they can reduce the number of plumbing vent penetrations at the roof, they won't get blocked by frost, they're listed and approved by several listing agencies, and they cost way less to install than a plumbing vent. Oh, and they're not legal here in Minnesota. Our old home-grown plumbing code used to specifically prohibit the use of air admittance valves (AAVs), but the new plumbing code that was adopted in 2016 is silent on the matter, which means the same thing. AAVs aren't allowed. If my memory serves me correctly, there was some confusion about this back in 2004 (? ), and there was a loophole in the plumbing code which may have made them legal for a month or two, but that didn't last long. If you're reading this and you know the exact details, please leave a comment. At any rate, they're not legal here in Minnesota. As mentioned in last week's blog post, plumbing vents allow air into drains to replace water. When water leaves through a drain, it has to be replaced by air. To prevent air from pulling through a trap and pushing water out, a plumbing vent provides an easier, alternative path for air to enter the system. 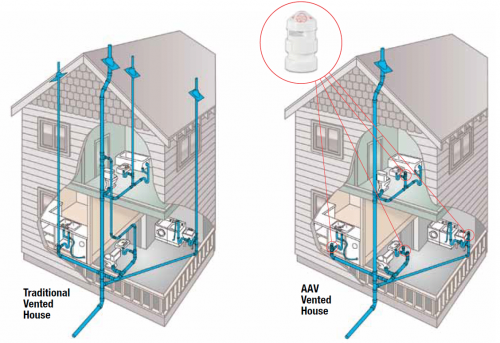 An AAV can take the place of a traditional plumbing vent at individual fixtures because it allows air into the drain without allowing sewer gas to enter the building. 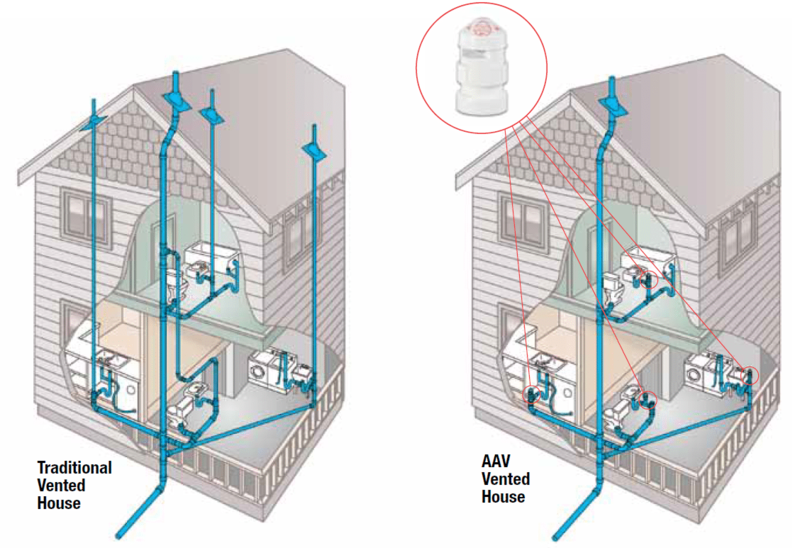 The diagram below, provided by Oatey, shows how air admittance valves can take the place of vents. To help protect plumbing trap seals, plumbing vents also allow pressurized sewer gas to vent to the outdoors. Because of this, every home still needs to have at least one full-sized plumbing vent installed, whether air admittance valves are installed or not. I occasionally run into these during home inspections, and I don't have an issue with them. If I find an air admittance valve, I let my client know that it's not allowed in Minnesota. This will probably create an additional expense if someone has licensed plumbing work completed in their home, and that's the main reason that I mention it. The concern over air admittance valves is that they rely on a mechanical seal that may eventually fail. Nevertheless, some manufacturers, such as Sioux Chief, offer a lifetime warranty on their air admittance valves. Studor offers a 10-year warranty and claims a 500,000 cycle lifetime. Another concern with an air admittance valve is that it might leak if there is a sewage backup. That's a valid concern, so I tried testing a bunch of AAVs to see if I could get them to leak. 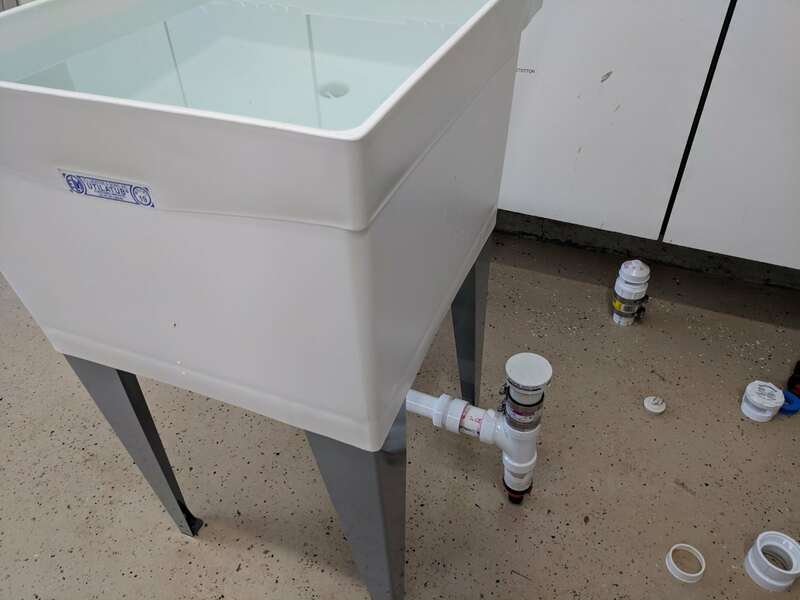 I set up a sink in my garage and blocked off the drain, and let the water go. No leaks. I even turned the vents upside down, and nothing leaked out.